Cookbooks recommended for holiday gift-giving. 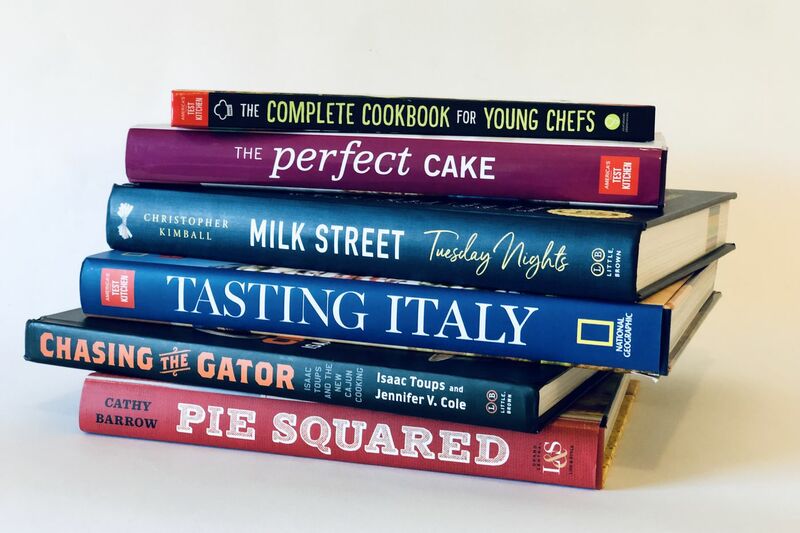 Whether you’re looking for a gift for a cook or looking to do some cooking yourself, these are the books to check out. Toups, born and bred in Cajun Country, brings authentic recipes with charming stories, often peppered with lively language. This Top Chef fan-favorite delivers the heart of Cajun cuisine from the familiar gumbo: chicken and sausage, smoked duck, or seafood to the more exotic. Hog’s head cheese or chaudin (ponce), a sort of Cajun haggis, will appeal to the more adventurous nose-to-tail eater. — Robin Currie. Comfort is the warm winter blanket we all need, but in book form. Whaite, the winner of Season Three of The Great British Bake Off, gives us a perfectly titled book whose chapters are organized by comfort cravings: Something Crunchy, Spicy, Pillowy, Cheesy, and Sweet. There’s truly something for everyone. Try the sweet potato gnocchi with Amaretti and brown butter. — R.C. Milk Street: Tuesday Nights, by Christopher Kimball. ($35; Little, Brown) Inspired ideas for weeknight meals organized under the headings Fast, Faster and Fastest — which translates to ready in 45 minutes, 30-35 minutes, and under 30 minutes. Perfect for busy parents who still emphasize sitting down for real food together each night. Try the gruyere and chive omelet, Spanish eggs and potatoes, or ginger beef. — A.S. The Perfect Cake: Your Ultimate Guide to Classic, Modern and Whimsical Cakes, by America’s Test Kitchen. ($35; America’s Test Kitchen) More than 240 recipes for both classics and cakes you’ve never heard of (but will want to try), with beautiful photos and step-by-step instructions that will yield a Pinterest-worty cake from even a hesitant baker. Try the classic red velvet, the towering rainbow cake, or the ultra-impressive yule log. Pie Squared: Irresistibly Easy Sweet & Savory Slab Pies, by Cathy Barrow. ($28; Grand Central Life & Style) I first picked up this book looking for outside-the-circle Thanksgiving pie ideas but found myself drawn more to the many savory recipes, like the carbonara zoodle slab pie (I love an excuse to use my spiralizer) and the eggs Florentine slab pie (gluten-free thanks to a hash brown crust). On the sweet side, try the chocolate pecan or no-campfire-necessary s’mores. — A.S.
Part travel guide, part cookbook, Tasting Italy is for anyone who loves Italian food, has been to Italy, or dreams of going to Italy. Effectively arranged by region, the 100 recipes by America’s Test Kitchen and photographs by National Geographic are a love letter to Italy. Try the agnolotti, filled with beef short ribs and cabbage, topped with a hazelnut sauce, the perfect winter soul food. — R.C.